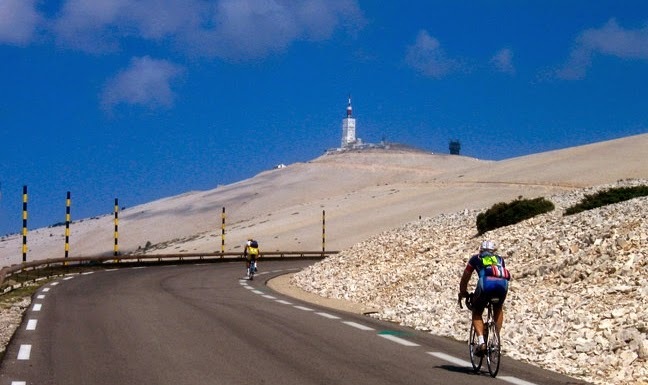 2014's cycling challenge to help the Royal British Legion and Cancer Research UK: 1000 miles solo & unsupported from Blackpool to Mont Ventoux in 8 days, and then up & down Ventoux six times in 24 hours...more climbing than the height of Mount Everest. La Bicinglette, I hope! - There are three roads up to the summit at 6300 feet and to complete this challenge you need to ride each climb twice in the same calendar day. So that's 6 x 14 miles at an average gradient of 9%...same as cycling from Preston to Carlisle...up a 9% incline. Looks like someone's got an early start, hah-hah-d'oh! - The total amount of cycling is 170 miles and the total amount of climbing is 29,500 feet. Mount Everest stands at 29,029 feet. The only good news that I can take from this is that half of those 170 miles are downhill. You can't exactly relax though, especially given that the first descent will be in the dark...I have been warned about various nocturnal animals darting out in front of you. Oh deer. - The weather will have a big old say in how kind the climbs will be. The highest recorded wind speed at the summit is 200 mph, although since I gleaned that 'fact' from Wikipedia it may not bear scrutiny, hah-hah! Scratch that: just checked and unfortunately it does. Also, we can expect it to be a f**king oven once the sun rises, so that will be nice! Must not fixate on Kronenbourg 1664 or similar. Above the tree-line there ain't nothing going on. Except the climb...still, looks nice doesn't it? - Last year Chris Froome was on his way to winning the Tour de France and finished a stage on top of Ventoux. The lanky so-and-so absolutely stormed the 14 miles and 5000 feet in 59 minutes. Each climb will take me about 2 hours and 30 minutes. Not expecting any calls from Sir Dave Brailsford! It is fantastic to see donations for Cancer Research already, so a really big thank you to those who have dug deep. As per previous years I will donate £1 for every £5 raised: if you can select Gift Aid too on the JustGiving pages then we are on to a winner! The links are over on the right and also just below...cheers! To support CANCER RESEARCH UK please click on this...thanks! To help the The ROYAL BRITISH LEGION please click on this! Follow this to help fight against cancer! Click here to help the Royal British Legion! They always need our help. Please click on the poppy! Total Pageviews. Ding-dong! Go on, share this lunacy. By me. Dreamt up via Guinness. What on earth was I thinking of... Picture Window theme. Powered by Blogger.